A qualified Primary School teacher and experienced singer and music educator, Hermione was the music specialist teacher at St John's Walham Green CE Primary School before moving on to Robinsfield Infant School in St John's Wood, where she was responsible for music teaching across the school. She co-founded and directed the children's choir at Our Lady of Perpetual Help, Fulham, and was the co-founder and manager of Fulham Camerata. Hermione completed a MA in Music Education at the Institute of Education and is currently researching for a PhD on music participat﻿io﻿n, as well as lecturing ﻿﻿on the Primary PGCE course at Exeter University. Hermione teaches singing privately to both adults and children, as well as performing regularly as a soprano. Richard is an experienced pianist, organist, teacher and choral director. 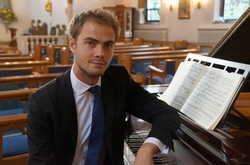 A graduate of Kings College London, where he was organ scholar, he is currently studying Piano Accompaniment at the Guildhall School of Music and Drama.